Why don’t more companies understand if they get the “right” things “right” with customer experience success will come? Making money is not the goal but it’s the result when the company keeps the customer in mind. All companies today are in a foot race. Unless the company is obsessively trying to make the customer happy, the company risks losing. 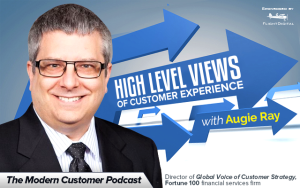 My latest podcast guest is Augie Ray, director of VOC Customer Experience Action for a Fortune 100 financial services company. Augie writes frequently about customer experience. He recently wrote a post (that we discuss in this podcast) about how too many companies treat customer experience as a program and not a purpose–something to be assigned to a couple of employees while the rest of the company goes about its business improving efficiency, acquisition, and margins. Augie–citing Forrester–says only 25% of CX professionals say their companies’ customer experience programs actually improve customer experience. He also shares a study indicating that 81% of organizations have seen their Customer Experience Management (CXM) initiatives fail in the last three years. Augie Ray doesn’t believe everyone in the company is a marketer, nor are they a salesperson. But he does believe everyone in the company should be focused on customer experience. Companies like Uber and Nest understand the power of customer experience and are reaping the benefits. In this podcast not only do we talk about customer experience case studies, we also take a deep dive into a discussion of ROI. Leaders often want to know of the ROI of a customer experience program. But what is the ROI of doing nothing? Even if you do nothing for the customer experience it will still cost you. There is an impact to not fixing what is broken about your customer experience. Examples of the negative ROI of doing nothing include loss of market share, the cost of ceasing to innovate, and the risk of not differentiating yourself from the competition. Short-sighted management and quarterly demands of “the street” are getting in the way of a clear vision–and hurting customer experience. In this podcast, we talk about social customer care, why most companies are still struggling with call volume (and make it the customer’s problem) and other major customer service fails.